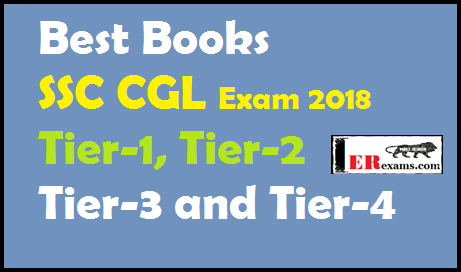 Best Books SSC CGL Exam 2018 Tier-1, Tier-2, Tier-3 and Tier-4. This article provide you Best and useful Hindi and English books SSC CGL Exam 2018 Tier-1, Tier-2, Tier-3 and Tier-4 Exam 2018. Here provide you best authors best books for SSC CGL exam 2018. Best books for SSC CGL Exam 2018 General Intelligence Reasoning, General Awareness, Quantitative Aptitude, English Language, Statistics General Studies (Finance and Economics). In SSC CGL 2018 the candidate who needs below table provide you some best books for English both Tier-1 and Tier-2 exams best books. In SSC CGL 2018 the candidate who needs below table provide you some best books for Quantitative aptitude both Tier-1 and Tier-2 exams best books. In SSC CGL 2018 the candidate who needs below table provide you some best books for Reasoning both Tier-1 and Tier-2 exams best books. In SSC CGL 2018 the candidate who needs below table provide you some best books for General Awareness both Tier-1 and Tier-2 exams best books. In SSC CGL 2018 the candidate who needs below table provide you some best books for Best Books all Subjects and Previous Years Solved Papers and SSC CGL Exam 2018 both Tier-1 and Tier-2 exams best books. I hope this post help you crack your SSC CGL exam 2018. If you have any problem related to this exam comment below I will help you. In future I will update more books for exams so keep touch with website.